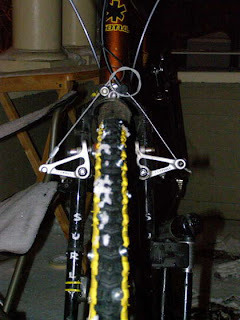 I wrote last week about trying to figure out a way to put spikes into my bicycle tire in an effort to make it more snow worthy when I was a kid. As it turns out, someone else had this idea and put up a set of instructions as to how it might be done. I was born 40 years too early or the internet came along 40 years too late. Not sure which it is yet? Read the comments after the instructions and there is one person who gives a link to a place where you can buy studded tires for your bike. Another gives a picture of tank like treads. 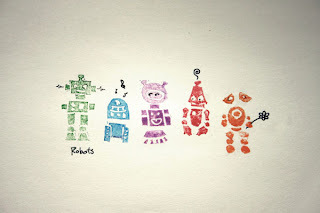 Somehow I missed this Botjunkie post in time to put on my Christmas Wish List. It would have been right at the top. My "Too Cool" rating at school would move up from the 2.5 it's been hovering at for the past two years to a 10 plus. We start school before the sun comes up and I can only imagine the sight of me coming down the dark suburban road riding my two legged, fire breathing machine that escaped from a Tim Burton remake of Star Wars. I'd build in two honkin big speakers and play Flight of the Valkyrie. Full Blast. Cars would pull over and mothers would shield their children as I stomped by. I'd cut my hair into a Mad Max style Mohawk. Trade my corduroy in for distressed leather and rivets. Rivets on my black jacket. Rivets on my over sized Doc Marten boots with the unnecessary but oh so menacing extra straps. I'd even have specialized rivets on the flye of my fire retardant canvas jeans. Rivets that would require a special motorized Black and Decker power tool to open. I'd have to a take tool box with me to the restroom that would send the normal, non-scary teachers running from the stalls with newspapers in hand muttering, "I think I'll just save my business for later." Most likely, I will change my name to Dragon Lord as Mr. G doesn't sound mean enough. I'd walk into the classroom smoke still curling around my head and shoulders. "Get to Work!" Is all I'd say and the children would rush to their tasks. Tasks and assignments they would create their own selves. Because they wouldn't dare bother me for anything as mundane as classwork or homework. It would take all responsibility for learning off my shoulders. My principal would bring me cups of coffee and tasty little finger sandwiches for lunch. In fact, she would offer to do my lunch duty for me as my presence in the cafeteria would cause the children to lose their appetite and the milk to curdle. Daily I'd stand in front of the room with my arms crossed. Probably because sitting with rivets in one's pants might be slightly ouchy. Staring straight ahead as though I could see into the depths of a smoldering underworld where Hephaestus himself hammers out machines such as the one I ride. My portable music system built into the head of a rhinoceros skull would sit at my feet and belt out the harsh sound of obscure European metal bands until it was time for me to stomp home. In the twilight. Shooting flames. Watch the video and live in fearful anticipation for the day that Mr. Dragon Lord gets his own pimped out StompCycle! 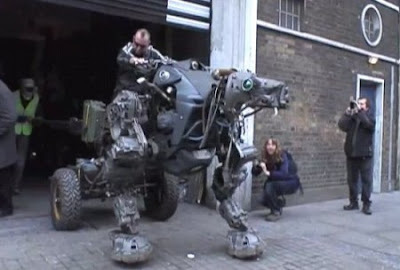 [Image captured from Botjunkie: Robodogoflameocycle: http://www.botjunkie.com/2008/12/10/robodogoflameocycle/]"
Video discussing Corey Vidal's success with his YouTube video where he lip syncs to the Moosebutter "Star Wars" song. These videos could be a good discussion starter for how you go about building a presence on the web. I've got lots of high school video buffs who hope that they will one day gain fame and stardom via the net. Here is an example of one young man who did just that. The weather here in Denver looks to be pretty mild for the holidays. There's a little snow on the ground but not much. 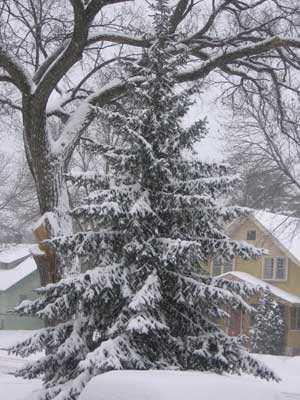 So, thought I'd put up a few shots I took last weekend in Minneapolis to make it feel a bit more like a white Christmas. 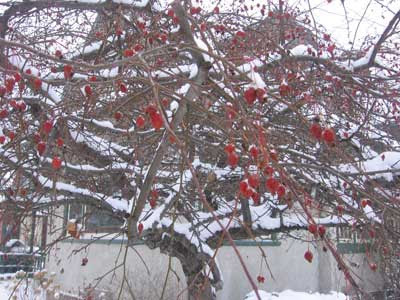 I don't know the variety of this tree but the red fruit peeking out through the falling snow was beautiful. This big old pine is magnificent. Since coming back to Colorado, I've not worn my hat and gloves once and often will walk out the front door without zipping up my coat. 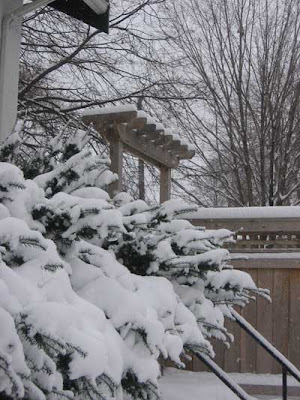 In Minnesota the snow is beautiful. The people are lovely. Children are rosy cheeked. But, the cold hurt my bones. So I do believe that when I retire it will be down to New Mexico and not further north. When I was a boy I used to make up detailed lists of what I wanted for Christmas. I'd spend time poring through the Sears and JC Penny's catalogs detailing out the perfect gifts. I usually got something off my list but I think the dreaming and planning were more fun than actually getting the gift. Somewhere along the path to adulthood the presents became less important to me and I stopped making out a list. Now I ask friends not to give me anything. I've got more than enough. 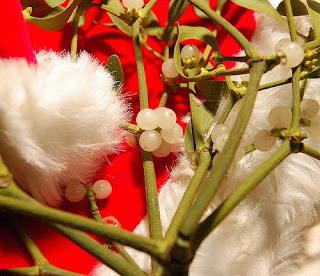 A little peck on the cheek under the mistletoe and maybe time spent singing a few songs seem to mean more to me now. But, I still like looking through all the catalogs that come through the mail. There are sure a lot more than there were back then. And the internet! It's just one big old Sears catalog for a slightly balding boy like me. I still like to wish a little. Here is what my list would look like now. 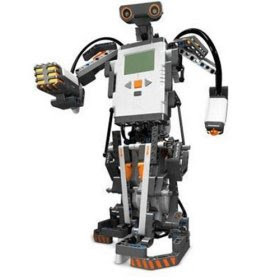 I taught a Middle School Technology lab for seven years and I have to say one of the best stations we had in the lab was one built around Mindstorms. Even taking away the programmable brick, I would still want a module overflowing with Lego parts and pieces if I were ever to have a tech lab again. I miss sneaking in to build killer robots when the kids were gone for the day. I have this dream of one day clearing a space out in my basement and setting up a bench where I can build my creations and not have to share my toys with any pesky students. Patrick Costello and his father Pat are creating some banjos out on the Delmarva peninsula that have me wanting to cheat on my Goodtime Deering. She is still a good banjo and meets my needs just fine. But, Dang! Those Somerset instruments call to me like banjo bottomed mermaids twanging on the heartstrings of lonely sailors. All American made. Hand crafted. And a sound, that best as I can tell over a YouTube video is great. I've thought about driving down to the Eastern Shore next time I'm out visiting my sister in Maryland to try one out. I fear if I do that, I will be a goner and won't be able to resist the temptation. 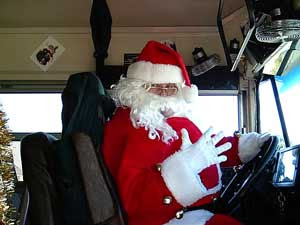 Until then, it's up to Santa. 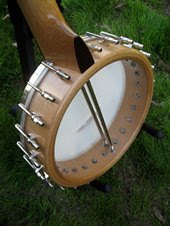 He can decide if a pretty much full grown man really needs two banjos. I'm ready for a new computer. 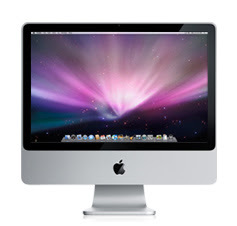 I'm always ready for a new, faster shiny computer, and I've got my eye on a iMac. I am anxious to try out the dual boot capabilities with the new models and to get one of those 20 inch screens on my desk. I'd add a second monitor just to make working with my Adobe programs a little easier. You haven't lived until you can put your workspace on one screen and all your menus and palettes on another. It's pure Geek Heaven. A double screen also makes it so much simpler when I'm grading a student project by having their work open on the main screen and my rubric on another. Did you hear that honey? A new computer would make my job so much easier and it would be so much more functional than a new couch. We don't need to sit. 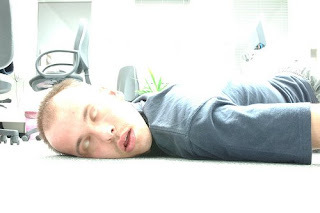 I could do everything I do at school plus a bit more with this software package. It would be swell if Santa tossed this cornucopia of productivity down my chimney this year. I love to run but haven't been able to for several years because of nagging knee and back problems. I miss it. 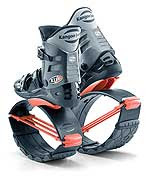 I saw these cool running boots a year or so ago. They drastically reduce the impact on your knees and feet by as much as 70%. I would once again be able to burst out of my front door on a spring morning and run through the streets of my neighborhood. My bottom half would resemble that of the Primus Transformer and I would probably frighten small children and send dogs running with tails between their legs. But, it would be worth it to run again. They cost several hundred bucks and I'm the kind of guy who has a hard time paying more than a dollar for a cup of coffee. So, I put this idea away thinking I might revisit the concept if the price ever went down or I could find a place locally to try them out before committing to the hefty price. 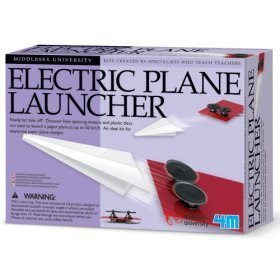 After all, I could get a Mindstorm's kit for that kind of money. Recently I read a post by Doug Kelsey who writes the blog, The View. He has a pair and likes them. He bought his on eBay. I looked and sure enough, I can probably pick up a pair for $50 or less. If it's meant to be, a pair in size 11 will soon pop up and I will put my bid in. Otherwise, they will stay on my wish list. So, that's the list. Do I really want all this stuff under the tree for Christmas. Not really. I just like the dreaming. Like I said a few pecks on the cheek and good friends are all I really want. Now, excuse me while I go looking for a little mistletoe. I teach a High School survey class called Multimedia. It's main purpose is to get our incoming classes up to speed on some of the programs and equipment available to them in our building. I try to create a curriculum that is oriented towards helping my students succeed in their other classes and to this end I like to ask the rest of the staff what skills they would like to see me reinforce. In a recent request for this information from teachers, the two main items listed were creating better PowerPoint slides and citing web resources. The PowerPoint slide issue was by far the bigger concern. It isn't that the kids don't know how to make a presentation. They have the technical side down. It's that their slides are cluttered. They have too many bullet points. Text is hard or impossible to read. Graphics are blurry or pixelated. 2. If you are going to read it to me don't put it on screen! It's rough. I'm still thinking about it. Any suggestions from you other teacher types out there? If you had to give your students just one recommendation for creating a good PowerPoint slide, what would it be? I had an art teacher once who gave us all a potato and a carving knife. This was in the olden days when you could still pass out knives to young children in school without a special permit or safety waivers from all concerned stakeholders. We spent several class periods carving shapes into a potato half and then using it like a stamp by dipping it into tempura paint and then pressing it onto paper. We ended up with works of art on big sheets of butcher paper. This post from Make Blog (originally in Craft Magazine) reminds me of that activity. 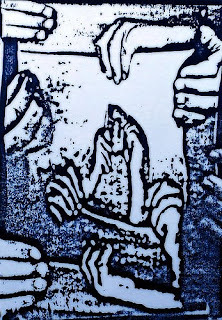 Instead of half a potato, you use a rubber eraser to create your own rubber stamps. This saves you from having to deal with your potato slowly rotting and going soggy, which if I remember correctly, was why the potato activity only lasted a class or two. "Remember when little Bobby Sue hand stamped the holiday wrapping paper. With stamps he carved his own self! That boy is going to be something someday. Sure as the sun shines on these old bones." I remember sitting around for an entire snowy, cold afternoon when I was about 11 wondering how I could outfit my bike for winter cycling. You've got to realize that boys in my neighborhood pretty much rode their bikes everywhere. I got on my bike to cross the street to my best friend's house. Moms could tell whose home we had invaded by the pile of bicycles in the front yard. I lived on my little Stingray in the summer. So, you can understand why winter was frustrating bike-wise. 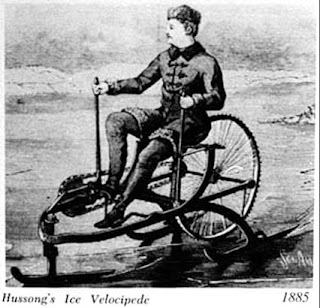 My dad had recently taken me on a snow mobile for the first time and I was thinking that there must be some way to re-design the tires on my bicycle to work in ice and snow. I got stuck on the concept of tank treads and sketched out several ideas along those lines. I went so far as to take one of my wheels off to try and figure out if there was a way to modify the rubber tire itself with spikes. My skill level didn't match my imagination though and I finally gave up on the idea. That afternoon of planning and dreaming came rushing back when I saw this page on winter bikes, Recycling in a Cold Climate and some related pieces linked from an article on Make. Show your students this article and have them come up with a design of their own on a cold, wintery day. Maybe they will be more persistent in their vision and actually create something a little more tangible than an aging man's memories! If I was still working with kids in a Technology Lab I'd show them this video and challenge them to re-create it. I think it could be built using Lego. Or if you have a collection of old toy motors and some rubber tires. Or have them come up with a design that doesn't use spinning wheels. Had an incident the other day where a student had a document that we couldn't open in Word. He knew it was made in word, just not sure what version. It had a .doc extension so I was pretty sure it was older than the version we use, which adds the .docx extension. I tried a couple of things to no avail. I then wondered if Google Docs might be able to read it. I uploaded it into my Google account. It came through perfectly. Then I downloaded it as a word doc and the student was able to open it in our version of Word and finish their assignment. I mentioned this to a colleague and later that day he had a student with a similar problem. That document was in Open Doc format and he was able to do the same thing. 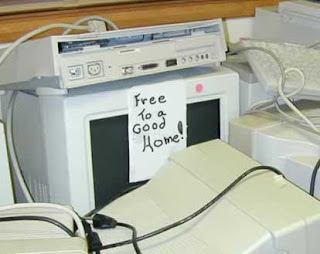 Not sure how many different formats you might be able to convert using this method. But, can't have too many little tricks in that magic bag, can you? 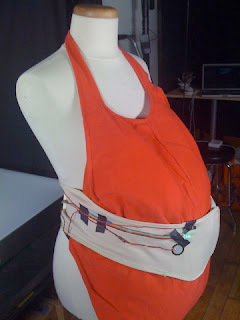 Here's a device the expecting mother can wear and when her baby kicks, a message is sent out via Twitter to the father. Or the entire family. Or if you really are a sharing kind of person, the entire Twitter world. Everyone could share the baby's little kick. Who doesn't want to rush over when a expecting mother says, "The baby is kicking. Does anybody want to feel?" "Yes sir. I'm better than all right. The baby just kicked." "Oh!" The expecting dad would say with a tear sliding down his cheek. "There he goes again. This kid is going to be a star soccer player." "Maybe you should sit down?" "Its alright. I'm alright. I'm only experiencing the miracle that is the creation of a human child within the womb. Now about those sales figures...."
Perhaps we could also create something that could be worn a little lower so that Dad could experience labor? He'd take those LaMaze classes a little more seriously if he knew he was going to have to breath through the miracle of childbirth contractions too! Every week those popsicle sites are the most popular. It got me curious so I dug a little deeper this week and looked at search terms that brought people to Painless Technology. Sure enough, "popsicle stick bridge" was the term that showed up most often. So, I went to Google and did a search for popsicle stick bridge and my most popular post shows up on the first page. I show up again on the next page of results. Second most popular search term? Homemade spy equipment or some variation on those words. I pop up fourth from the top of this search. If I were a devious man, I might start including those terms in more of my posts. My site would be one of those that people click to and say, "How is this relevant...stupid Google." and click away. But my numbers would go through the roof and somebody out there might mistake me for somebody that knows something or possibly the New York Times might quote me. Al Gunn, featured writer of the immensly popular Painless Technology recently said about popsicle stick bridges on his site: "I had great success with simple bridge building in my tech lab"
But, I'm not that devious and can only sit around the house bemoaning the fact that my pages don't come up in a search for "clever old man" or for "interesting technology teacher". Maybe if I wrote a post called "Interesting technology teacher builds a popsicle bridge to hide homemade spy equipment!" Maybe I need to rethink this whole Top 5 post thing? I saw this on the web and the description said that squares A and B were the same color. I thought it was a misprint as I knew that those two squares were not the same color. I squinted. I moved across the room. I looked at it from extreme angles. I held up two strips of paper on my screen to block out the green rod and the other squares. They still looked like two different shades. I knew that those two colors were not the same. I decided I would prove it and send a comment exposing this as an evil sham designed to strain the eyes of the unwary. I downloaded the picture from the site and opened it up in Photoshop. Test One: Using the eyedropper tool I captured the hex color in each square. They were the same. I didn't believe it and did it again. Repeatedly. I found a slight variation in a few stray pixels, but for all practical purposes they were the same. Test Two: Using the lasso tool, I captured a segment of square A and then pasted it into it's own layer. I then moved the square back and forth between the two squares. Freaky! It seemed to change color as I moved it. Test Three: Using the lasso tool, I captured a segment of each square and pasted them onto their own layer. Then I hid the original picture and moved the two squares side by side. Without the original picture, they looked the same. My convictions were getting pretty shaky by now. Test Four: I grabbed the color from square A and using the brush tool I painted the area between the two squares the same color. As I did this, suddenly, I could see they were the same. I no longer believe what I see. 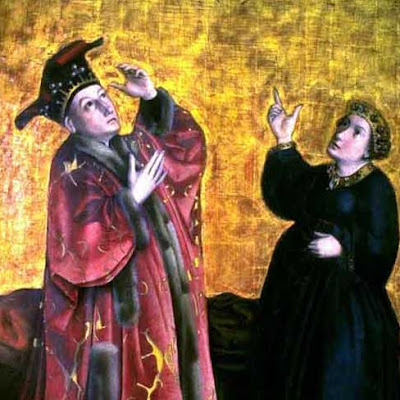 "In the real world, this wouldn't be the same grey, as B square is in the shadow of the column, so our smart brain corrects what it receives from the eye and optic nerve, and tells us that B square "must" (should?) be lighter than A square." That explanation makes a bit more sense to me than the more technical one on the site. Either way it is a fascinating illusion. Update: Visited the original site today and they've added a couple of graphics that help you see that the two squares are the same. Must of had a bunch of non-believers write to say, "No way!" 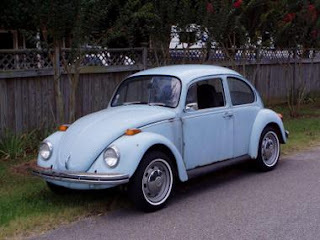 In 1978 I had a 1970 VW Beetle with 1972 engine. It was abysmally cold in the winter. It shook like a washing machine on spin cycle whenever I hit speeds of 70mph or higher. It really wasn't too great if I had more than one passenger as the back seat was pretty uncomfortable. It moved like a snail up steep roads. I miss that car. It got twenty five to thirty miles to the gallon. When it broke down, I was able to fix it using a simple how-to manual and a small set of tools. It handled great in the snow and during some of the worst snow storms in Colorado, I was able to get out on snowy roads along with the jeeps and other four wheel drives to gather needed hot cocoa and other supplies. I haven't had a car that economical since I sold it in the mid-eighties. I have a friend who is lusting after a Telsa Roadster. But at $100,000 a pop, I'd have to drive it a whole lot of miles, even at 135 miles per gallon, to make it pay for itself. Personally, I am attracted to the Aptera. It isn't going to be available here in Colorado for a while. Maybe I could make due with a Yaris until then? 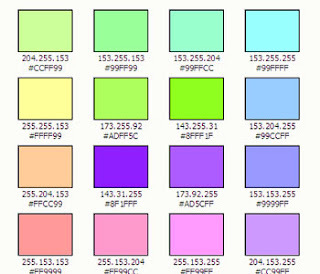 Here's another color palette generator I discovered recently: ColorSchemer-Online-v2. What I like about this one is that it quickly creates a palette of 16 compatible colors. It doesn't give the fine control of some of the other color generators out there, but for my beginning level kids, this is a good place to start. Enter a hex code or the RGB numbers, press a button and "wal-lah", instant pallette. I don't remember hearing about these lists before, so I went online to look up the previous lists. Doctors will get enhanced "super-senses" to better diagnose and treat you. This last one is the only new thing to pop up in a while. I'm glad to see that one of my funny bits got more than one hit. I suspect folks were just searching for the xkcd site and ended up at my blog reading this one post. Afterwards, anxious for more stick figure humor, they scurried off to find the real deal. Who could blame them? A teacher I work with was struggling to get some text off of a PDF document he was using in his History class and asked if I knew an easy way to accomplish this task. I knew I just recently had read something about a PDF converter but I didn't have anything like that in my bookmarks at work. 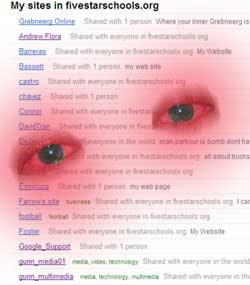 I searched all my emails with no positive results. I told him I'd have to get back to him but I was pretty sure I had a resource of some kind. "Larry Ferlazzo's site! That has to be it." My cat seemed impressed with my mental acuity and while she went back to licking her paws, I quickly went to Larry's site which I do have bookmarked and did a search. Sure enough I found the info about a program called PDF Undo. I tried converting several PDFs and they all came out perfect. Here are two minor issues I've run into using Google Docs in my classroom. Not big things, but minor headaches none-the-less. I had my Multimedia students create a Google Site. It was the first time I taught this in class and my students did great. My two snags occured as I started to grade the projects. First, I had one class make me a collaborator. I figured I could just go to my account and then open each Site at my leisure. This worked fine. What I didn't anticipate was the volume of Sites in my account with no way to organize them into folders. So, I've now got 30 plus sites filling up the Sites section of my Google account. Not a big problem, just a bother. I wised up for my next class and had each of them email me the link to their site. This was much more manageable. I'm also now wondering if I need to have all my kids un-share me to get those sites out of my list? Second, as part of the Sites assignment, they had to embed several Google docs into their pages. This worked...kind of. If they don't also share the doc with me, I can't see it. I get a message that says I don't have permission to view the document. This never occurred to me until I opened the first Site to grade. So, once again, a minor problem that I can fix by having them share the doc with me, but still, a bother. Next time I give this lesson, it will be perfect! OK. Maybe not perfect but better. "The CDC does a great job of surveying real doctors and patients to accurately track the flu, so why bother with estimates from aggregated search queries? It turns out that traditional flu surveillance systems take 1-2 weeks to collect and release surveillance data, but Google search queries can be automatically counted very quickly. By making our flu estimates available each day, Google Flu Trends may provide an early-warning system for outbreaks of influenza." This is kind of cool and thought provoking. What else can we predict about our society based on search trends? "Yeah Al, that's cool, but when would I ever use something like that with my students." He then slips out the door before I can come up with concrete examples. Richard answers the question of usability before it is asked. I like that and I think you will too.